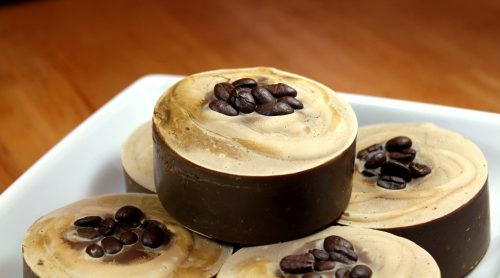 This homemade coffee and cocoa soap recipe is made with fresh strong brewed coffee, unsweetened cocoa powder and an entire egg for a luxurious feeling soap with a rich, thick lather. Plus it’s palm free! Since making homemade coffee soap in 2015, I’ve been dying to make another. 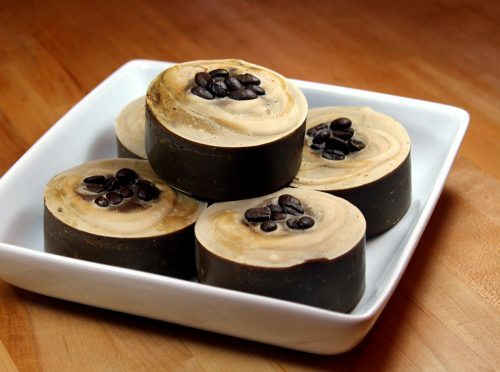 My homemade coffee soap recipe was, and still is, one of my most favorite homemade soap recipes of all time. 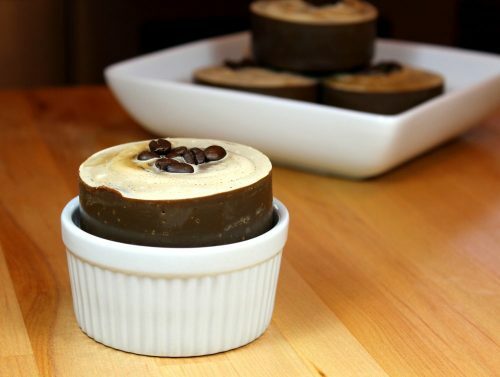 This time around I also wanted to add cocoa powder for a coffee and cocoa soap recipe. At the last minute, and probably because I was craving brownies at the time, I decided to add a whole egg to this recipe as well. In the same year I formulated my coffee soap recipe, I also made my first egg soap! Also making my list of favorite soap recipes of all time, my homemade egg soap recipe calls for two egg yolks. So I figured I’d mix it up a bit this go round and simply used an entire egg! Well, eggs are believed to offer skin care benefits that include tightening skin, shrinking pores, and calming redness and breakouts. In cold process soap, egg yolks are treated as a fat. As such they help to give egg soap a rich, thick lather. Egg whites, on the other hand, contain no fat whatsoever. 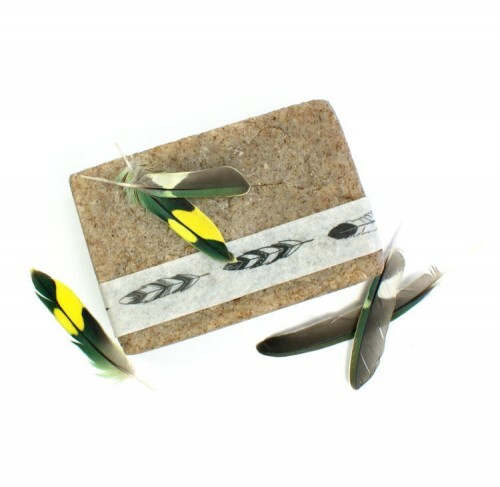 However, they do contain protein which has an astringent effect on skin. 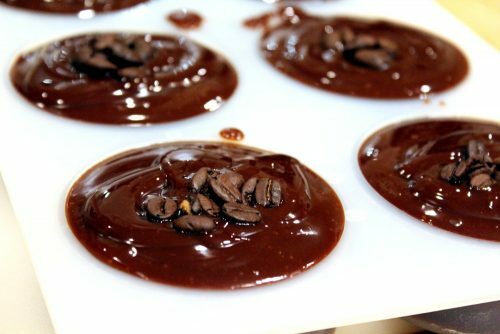 For my original coffee and cocoa soap recipe, as stated previously, I had not intended on using egg. 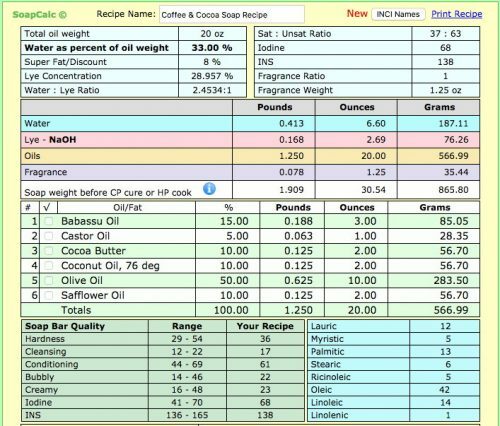 As it was a last minute addition, and this recipe has a high percentage of olive oil, you may want to reduce the amount of coffee (as percentage of oil weight) to 30% (6 oz.) Definitely do this if you are preventing your soaps from going through gel phase. Otherwise you will probably need an extra day or two to unmold these cleanly. It does firm up nice once unmolding though. 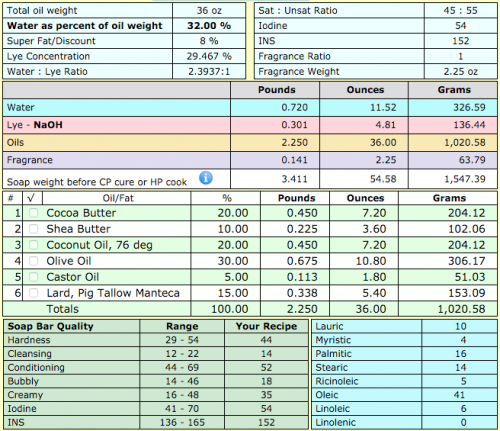 In addition, if you are using a fragrance oil – I did not – definitely reduce the amount of coffee. A hot fudge brownie fragrance oil would blend nicely with this soap as would a coffee or chocolate fragrance oil. Or perhaps chocolate cappuccino or chocolate cream cupcake? Without a fragrance oil the chocolate smell really starts to come through after about a week. It smells a little weird until then, but don’t worry. It’ll smell fantastic regardless of whether or not you choose to use a fragrance. To make my coffee that is used in place of the water in this recipe, I brewed 4 rounded Tablespoons in just over the amount of water called for in the recipe. (As we all know, those grounds can be greedy and some of the water content stays trapped in them.) I won’t lie and say I didn’t use a mocha latte flavored coffee because I totally did. Regular coffee would work just fine though. Also, a nice substitution for the unrefined cocoa butter in this recipe would be dark cocoa butter wafers. In this instance you could omit the cocoa powder entirely, or leave it in to make it extra chocolatey! 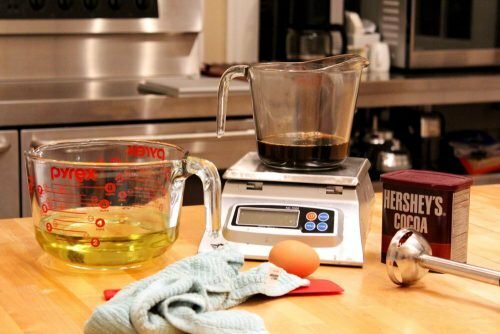 In addition, your egg will need to be room temperature to use in my coffee and cocoa soap recipe. So you may want to remove it from the refrigerator several hours before you intend to make this soap. You’ll also want to make your coffee ahead of time so it has time to cool to room temperature as well. Finally, I used the Crafter’s Choice basic round silicone soap mold for this recipe. But you can adapt the recipe to fit your own mold if you like. 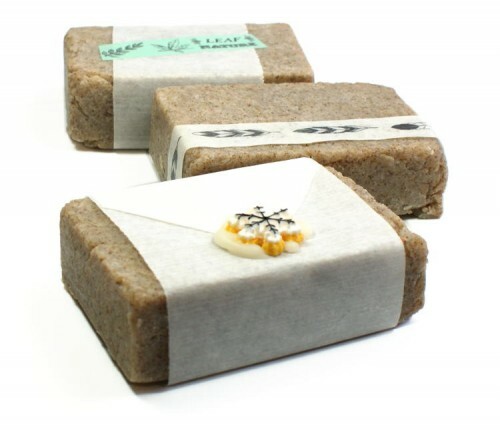 You do need to be familiar with making cold process soap for this recipe. You’ll follow my basic cold process soapmaking instructions. 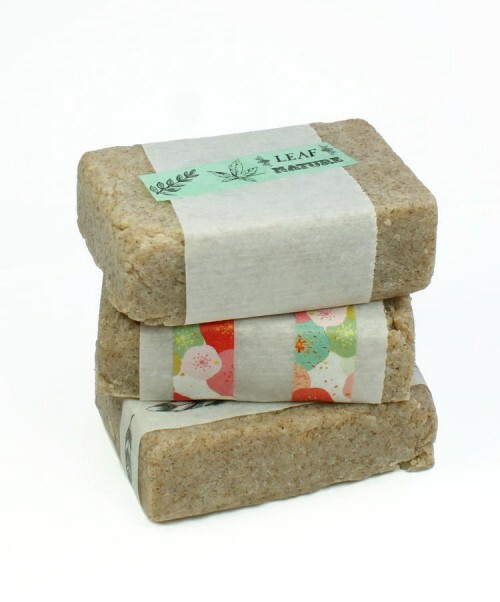 If you’ve never made cold process soap before – or any kind of soap in which you’re working with lye – I strongly recommend you start with a beginner soap recipe so you get a feel for the process and know you can create a successful soap. You’ll begin by mixing your lye-water. Or, in this case, lye-coffee. Measure out the amount of (room temperature) coffee needed into a heat proof container. Set the lye-coffee aside to cool. 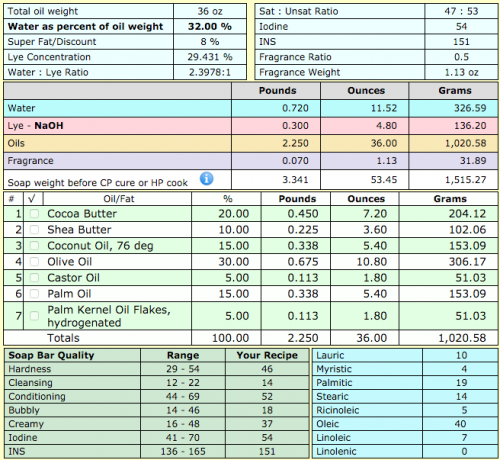 Next, use your digital scale to weigh out the cocoa butter and soapmaking oils. Heat in a non-aluminum pot over medium to medium-low on the stove until your ingredients have melted completely. Alternately, you can also heat them at 50% power in your microwave in a large glass Pyrex measuring cup until the cocoa butter has melted. 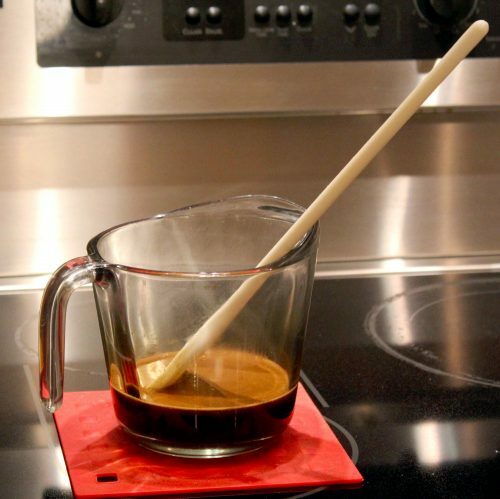 Allow the lye-coffee and your butter-oil mixture to cool to room temperature or around 76°F. Using a measuring spoon, measure out the sodium lactate and stir it into your lye-coffee. Now temper your egg. To do this, remove about a cup of oil from your soapmaking oils. Whisk the entire egg (no shell, of course) into the oils. 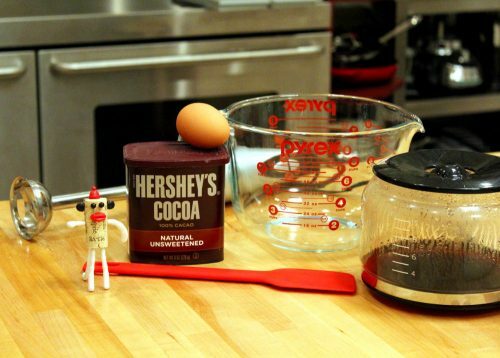 Using measuring spoons, measure out the unsweetened cocoa powder. 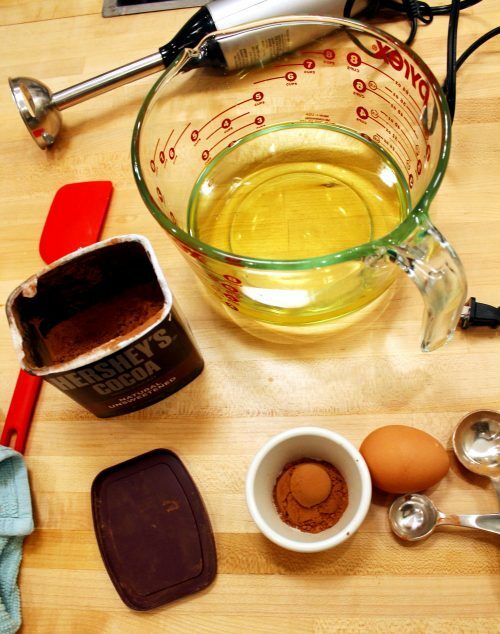 Use a stick blender to incorporate the cocoa powder into the oils. Return the oil with the egg mixed into it, to this container and mix again briefly. Now pour the lye-coffee into the oils. 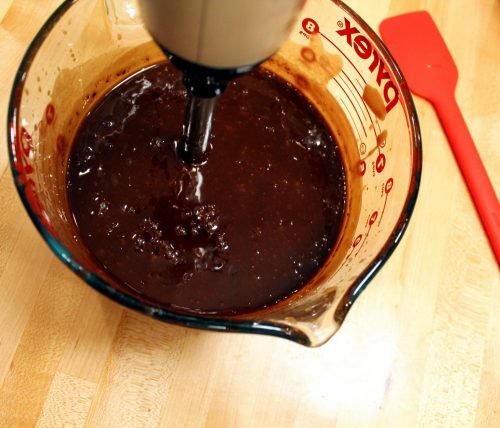 Mix with a stick blender until you reach trace. Please note that my coffee and cocoa soap recipe does take a while to trace. 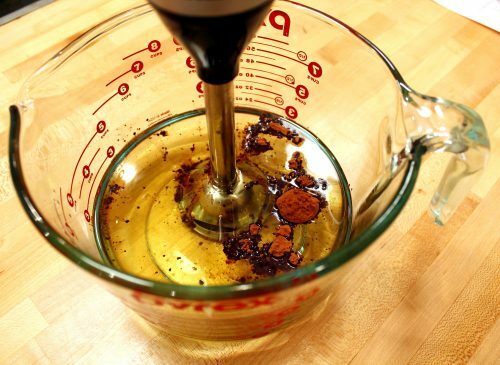 If you’re using a fragrance oil, add it at light trace and keep mixing until the soap batter is like a light pudding. Pour the soap batter into all six of the mold’s cavities so each is filled. Then go back and circle any remaining soap on top of the soap you just poured. 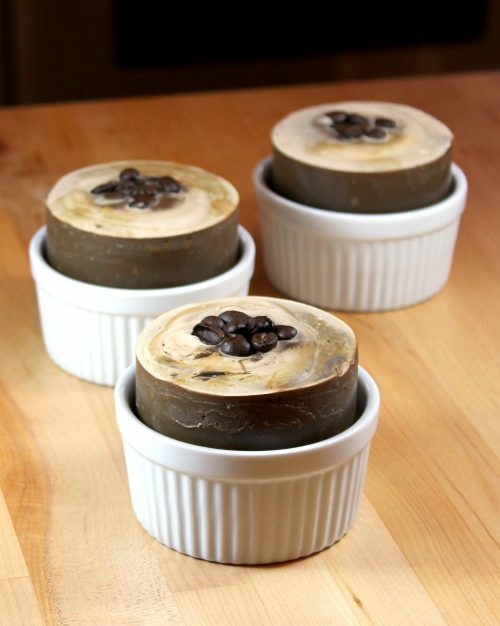 If desired, you can add whole coffee beans or another decorative element or soap embed to the top of each of your soaps as an accent. Because it’s winter and much colder in my house right now, I got soda ash on the tops of my soaps. However, I loved the contrast between the color of the soda ash and the color of the soap and the coffee beans so I left it on my soaps. If you don’t like the way it looks, you can simply steam or wash it off. Allow to cure four to six weeks before using. 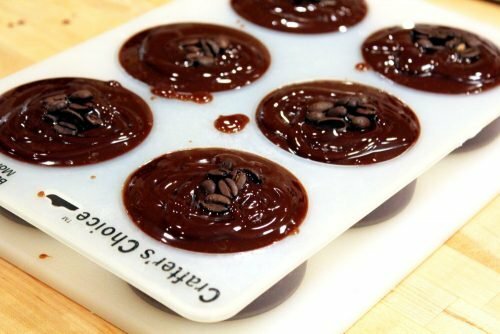 Don’t have time to make my coffee and cocoa soap recipe? Be sure to check out my check out my favorite coffee and chocolate themed artisan products on Etsy for homemade coffee and cocoa soaps you can buy! Or try Starboard Soap Co.’s Farm Fresh Egg Soap.